How Much Has Snow Removal Cost the City in Recent Years? The amount the city budgets each year for snow removal is set by a formula in the City Charter. 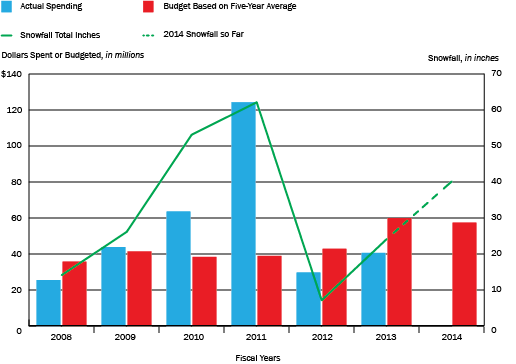 The formula is the average of spending on snow removal in the five prior years—so the budget for 2014 is based on the actual amounts spent in fiscal years 2008–2012. In some years the formula provides more funding than is needed while in other years, such as 2011 when the city had an extraordinary amount of snow, the formula-driven budget fell $87 million short of need. The formula budgeted $13 million more in 2012 than the city needed for snow removal and $19 million more in 2013. If there is unused funding in the snow budget, that money is reallocated or becomes part of the city’s end of year budget surplus. Conversely, if the budgeted amount is short of what is needed, funds are drawn from other parts of the city budget to cover the expense.